I wanted to do something festive for Saint Patrick's Day and I knew the girls would have a blast helping me make these cupcakes (not to mention they thought the rainbow inside was beautiful). 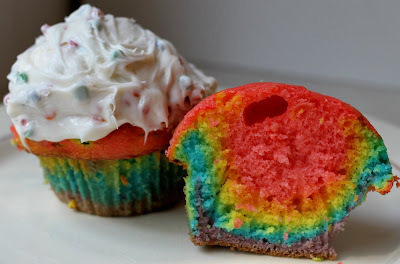 They took a little time to prepare, but they were just as easy as making plain cupcakes and the results are impressive :-). I found this idea (and many others to choose from) in the latest Family Fun magazine. 1. Prepare your favorite white cake mix, then divide the batter evenly among six small bowls. 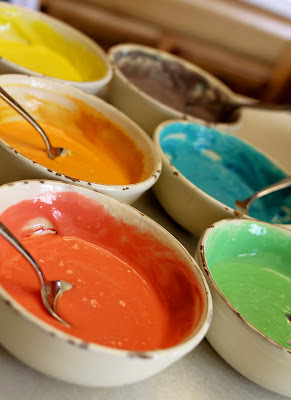 Following the chart below, dye each bowl of batter a rainbow color. 2. Line 16 muffin pan wells with baking cups. (I only had enough batter for 12, but mine were a little too full) Evenly distribute the purple batter among the cups, then the blue, and so on, following the order shown. As you go, gently spread each layer of batter with the back of a spoon to cover the color underneath. 3. 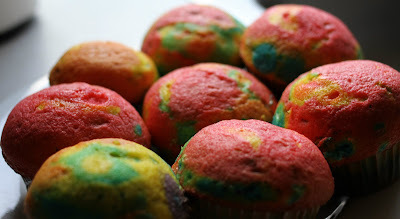 Bake the cupcakes according to your recipe directions. Before serving, remove the paper wrapping, and if you like, top each cupcake with a whipped-cream cloud. I bet the girlies had a blast!